I reviewed Wire Mother Monkey Baby: A Novel (Outpost19) by Austin's Rob Reynolds for Lone Star Literary Life. It's a mixed review but Reynolds has tons of promise. I look forward to his next novel. Clayton Draper, attempting to jump-start his stagnating life, moves into a new development in Austin called The Complex, one of a new trend in “all-inclusive” apartment communities boasting sports facilities, restaurants, bars, and cinemas, among other distractions—ahem, I meant attractions—subsidized by corporations. Draper’s new home, sponsored by Kool Kola, is a “microcosm of the outside world,” he writes, “only more micro, less cosmic.” Draper’s new home of exposed brick and cathedral ceilings includes a Kool Kola vending machine, which is inventoried monthly by a judgmental service technician. Draper, the ingrate, isn’t drinking enough Kool Kola. Absurdist humor and clinical depression infuse Reynolds’ debut in equal measure. We know Draper’s in trouble when he begins referring to Austin as “Waterloo.” He tries various strategies for happiness: Retail therapy at San Marcos outlet malls, adding “something tangible, verifiable, to [his] life”; quits his job for freelance (“Refusing to bow to the god called Security”); and the geography cure, a trip to Paris, but Draper stays firmly in character, and wherever you go, there you are. 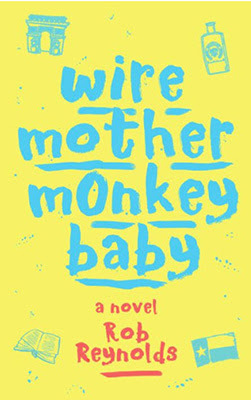 Wire Mother Monkey Baby: A Novel is the first book from Austin’s Rob Reynolds, former associate and contributing editor of the Harvard Review and Boston Book Review. Reynolds’s short fiction appears in the Tampa Review and the Kennesaw Review, among other publications, and was anthologized in You Have Time for This: Contemporary American Short-Short Stories. His first novel is a commentary on happiness in the twenty-first-century United States where appearance trumps substance, we’ve lost the distinction between alone and lonely, and we make ourselves ill contorting to fit the mold. First, that title: Wire Mother Monkey Baby alludes to psychologist Harry Harlow’s experiments with infant rhesus monkeys involving maternal-separation, dependency needs, and social isolation. The monkeys were separated from their mothers within hours of birth and presented with surrogates either made of wire and holding a bottle of food or covered in terrycloth but lacking food. The baby monkeys with the terrycloth mothers, food or no, benefited from contact comfort, a psychological resource unavailable to the well-fed but psychically damaged babies of wire mothers. Draper has material riches—the wire mothers of materialism—but he’s an emotional train wreck. I was initially intrigued by Reynolds’ sardonic style and clever word play. However, Wire Mother Monkey Baby is light on dialogue and storyline, heavy on exposition and interior monologue. The quick pace soon trips on little external conflict or plot. Reynolds’ sharp social commentary is spot-on, if confined to first-world problems; I’m reminded of Huxley’s A Brave New World and Eggers’ The Circle. Reynolds has created a nuanced character with merit, even though his neurotic, semi-alcoholic navel-gazing becomes tiresome. Wire Mother Monkey Baby is frequently entertaining and engaging, but pervasively uneven. Reynolds is talented and promising. I look forward to his next effort.